Watch and wager on the $10,000,000 Dubai World Cup this Saturday on TwinSpires.com and, while you're at it, pick up an extra 10% on your winnings whenever you cash a winning Daily Double ticket. That's right, whenever you cash a winning Daily Double on the $27 million Dubai card this Saturday morning, we'll give you a credit equal to 10% of your gross winnings, up to maximum of $500 for the day. 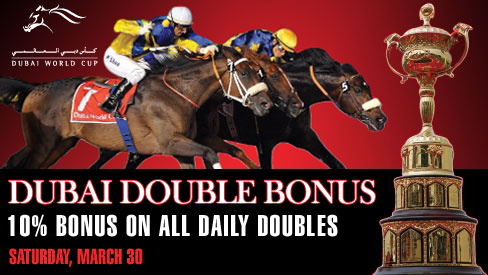 With 8 races on the card, there's 7 Daily Doubles and 7 opportunities to cash in on our 10% Dubai Double Bonus. Be sure to set your alarm early, as the 8-race card from the Arabian desert gets underway at 9:10 a.m. Eastern, 6:10 a.m. Pacific Time.